Born in Newcastle the North East of England, Emily Hughes was pretty much born a dancer. She started dancing at the age of 3 and quickly found out that this was to be her life passion. As a young child she attended the Royal Ballet Schools associate program and at the age of 14 was accepted into the prestigious Elmhurst School for Dance associated with Birmingham Royal Ballet where she boarded and trained in ballet and other styles of dance everyday for 5 years. She believes that without this experience so early on she wouldn't have learnt the dedication, focus and resilience to life that she has now. Since performing professionally, Emily has performed in ballet companies in the Uk and abroad and appeared in West end productions such as Phantom of the Opera and the Christmas show of The Snowman, aswell as being on TV. She now combines her love of dance with teaching yoga, feeling passionate about opening up spaces for people to be themselves and to start feeling again. I have always considered myself to be a great listener. I think we need more of them these days. Listening not to turn the situation onto ourselves but to really, fully be present with the other person. Allowing them to have the space to openly share and from there we can respond with complete compassionate awareness. Always finding the courage to go after whatever it is I'm passionate about and remaining flexible with the journey. I think it's so important to have visions and goals in life but if we limit ourselves to only seeing one way to achieve them then we often end up disappointed when they don't happen. Life is always throwing us curve balls down the line and I think they are here to help us grow and learn about ourselves. I always love the saying life is about the journey, not the destination. My grand vision is to one day open up a sacred community where people can come and feel like they can be completely themselves. A place where they can come and connect with other beautiful souls, practice yoga, meditate, eat nourishing food, have their me time to unwind and just soak up the love. I feel so passionate in helping people to overcome this worldwide disease of believing they aren't good enough. It's so sad and far from the truth yet I think we can all relate to experiencing it so I would like to help by creating a space where learning to value ourselves and our health and wellbeing is the norm. I think overall it would be to keep following my own bliss and to do it with a lot of love. One of my most memorable successes was the day I graduated from full time vocational ballet training and being offered my first job in a ballet company at 19. All those years of sweat, dedication and hours in the studio felt like a huge accomplishment. My childhood dream when I was a little girl was to be able to one day get up on the stage as a real ballerina in a beautiful white tutu so when that day came the little girl inside me was there, living every moment of it. I have a feeling though that my biggest success is still to happen. I've had a lot of challenging moments. Every time I went through an audition, an assessment, a technically challenging performance, the moment I decided to travel to India to take my Yoga Teacher Training, living abroad at 19. All of these times I have faced with incredible fear being present but it has taught me to feel the fear and do it anyway. Obviously a healthy dose of fear is needed sometimes and is there to protect us but when I'm passionate about something I really want to do I try and flip those nerves into excitement. Everytime you can break through those fear cycles your growing 10 times over. 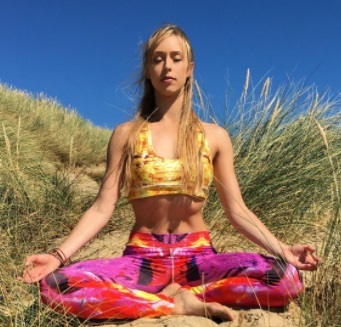 Rachel Brathen aka Yoga Girl is someone I always admire for her ability to be so real and raw. She has created so much for other people, always giving and providing for a better world. In my opinion she was one of the kick-starters to change the sometimes nasty and vicious world of social media into a place of inspiration and love. My friend Megan Preston who is making waves in the world. She runs a company called Move the world which focuses on harnessing the power of creativity to build positive global citizens and she was the founder of Dance London - a community network supporting dancers professional development. Her energy and passion for life is infectious and I owe it to her that I started thinking differently about life and how it should be lived and of course my beautiful family who always have my best interests at heart, even when I don't see them. They have been so supportive and present in everything I've done and I couldn't have done any of it without them there. I recently just came back from teaching yoga out in Ibiza and ended up staying out there for 3 months nearly. I never thought I would connect with the island as much as I did, having the notorious party side of it in my head but the island is stunning and full of magic. I now plan to hold retreats there in the near future. Agonda Beach in Goa,India is another favourite of mine. I spent a month there while I was doing my yoga teacher training. It's unlike the more touristy and crazy busy parts of the country. It's incredibly beautiful and calming, with long stretches of untouched beach and jungle, cows and dogs roaming everywhere freely, magical sunrises and sunsets and friendly faces you see everyday that you get to know and make friends with. My time there was a really touching experience. New Zealand is high on my list also. I mean it's a little trek to get there from London but if you enjoy breathtaking scenery, endless amounts of hiking and walks, beach drives, witnessing a place that gets the first sunrise in the world and so much fresh, clean air then I would definitely recommend it. I have so many places that I want to see still though, my list is long. I'm not really a product person so much but one I really rave about is a skin brand from Liz Earle. It's an all natural, plant oil based range and it genuinely feels like your at your own spa everytime you use it. I know it sounds strange to some but I use a tennis ball a lot on my muscles to help relieve tension. It's always handy to be able to whip one out from my bag when I feel the urge to roll. Overall yoga, dance and building community are my biggest passions. Once a dancer always a dancer and the way I guide my yoga classes are very fluid and free, almost dance like but it goes beyond what is taught on the mat. The mat and ourselves is the starting point and then from there we need to share what we learn to the world around us. I want to help end this belief of not being worthy, or not feeling accepted/loved by helping to rebuild the connection of everyone which is a little lost right now. Also I want to start salsa classes this year, I might be a dancer but I've never done salsa and it looks like so much fun. So if anyone fancies putting in their heels and learning to salsa while sipping on something fruity then come join me.